Application can configure the Data Manager Navigator component to show this dialog box by selecting the "Register Configuration Items..." menu option. Typically, the user would right-click a federating CMDB that he/she wants to register configuration items. This would bring up a pop-up menu with an option to "Register Configuration Items...". The dialog box presents the user with a list of MDRs that they can select. 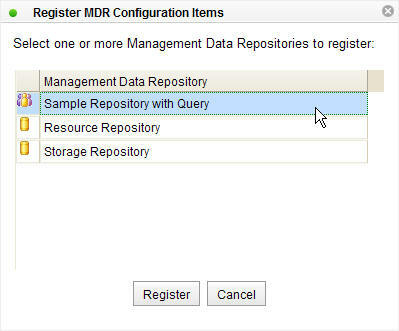 When the user clicks the "Register" button all the configuration items associated with the selected MDRs will be registered with the federating CMDB. A response is returned from the federating CMDB that indicates if the configuration items were registered successfully. The response is displayed to the user as a list of configuration items. The display also indicates if the registration request for each configuration item was approved or declined. This is illustrated below. This page was last modified 12:19, 24 June 2008 by Sheldon Lee-Loy.